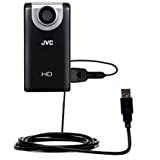 Charge the JVC GC-FM2 Pocket Camera while synchronizing data with our unique Gomadic Hot Sync and Charge Straight USB cable. Cut loose the rest of the cords protruding from your PC to make this cable the hub of your mobile workstation and enjoy a minimalist workspace anywhere you go. Built using the unique Gomadic TipExchange Technology, this cable is not like the others in that the same cable can be used to work with thousands of additional devices by simply changing the physical connector tip. We start you off with the specific tip for the JVC GC-FM2 Pocket Camera . However additional tips for nearly every other device can be purchased separately. Of course this product, like all Gomadic products, is backed by our lifetime warranty.